Safer play, not necessarily faster play. 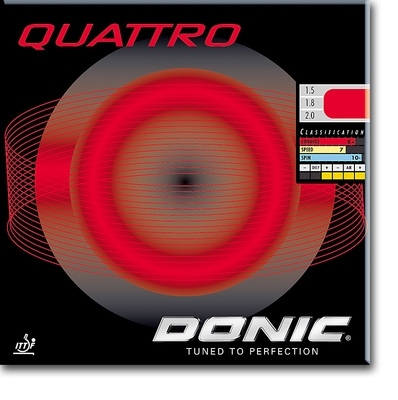 The DONIC QUATTRO with FAKTIS Technology. It is old hat to produce control rubbers from soft sponge. We were no longer satisfied with that. A soft sponge also requires a soft top surface to achieve harmony between the top surface and the sponge. Our experts therefore developed FAKTIS, a technology for the top surface of control rubbers. FAKTIS top surface rubbers are as soft as control sponges. Pimple In, Control 8+ Speed 7 Spin 10 -, hardness Soft, surface Control Elastic.